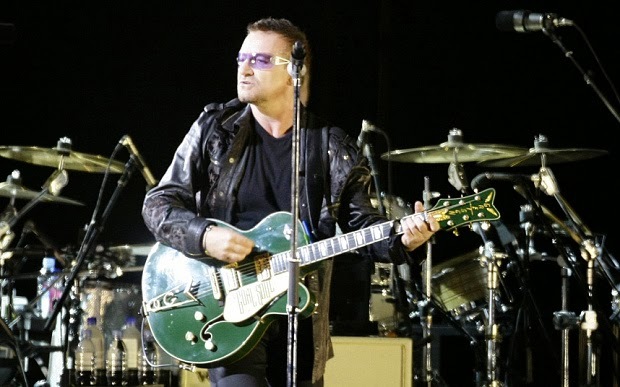 After his bike accident last year, Bono, the U2 frontman, may never be able to play the guitar again. It was in November that he took a hard spill in Central Park of New York City and was immediately taken to the Presbyterian/Weill Cornell Medical Center. At that time, it was explained by Dr. Dean Lorich that reconstructive surgery was needed by Bono on his arm, face and shoulder. He suffered various injuries, which also included the three fractures in his left shoulder blade. Now, the musician seems to have shared the potentially alarming consequences of the accident in a post on the official website of the band. Bono began the post lightheartedly by stating that even though he had broken his face, arm, elbow and hand, it was his Irish pride that had really taken the fall because he had been wearing black and yellow LYCRA cycling shorts under his tracksuit and not something rock-n-roll. Then he mentioned that the recovery process had proven to be much more difficult than anticipated due to which it is uncertain that he may ever play guitar again. He asserted that the band hand reminded him that the neither the Western civilization nor the members were dependent on this factor. Nonetheless, the musician is absolutely heartbroken at the mere thought of never strumming an instrument again. He seems determined to continue his passion so it is not over just yet. He said that he would terribly miss playing his guitar and not just for writing tunes, but also for the pleasure of it. The title of the post was Little Book of a Big Year: Bono’s A to Z of 2014. The star lists memorable events of the band in the past 12 months while going through the alphabets. Most of the list is positive, especially when he reaches O where he mentioned U2’s appearance at the Oscars where they were photobombed on the red carpet by Benedict Cumberbatch. He said it was a memorable moment as they got to meet their idol and had ‘one hell of a night out’ at the Oscars.